I received this eProof for free from Orion Chlildren's Books via NetGalley for the purposes of providing an honest review. Today, I want to talk about The Astonishing Colour of After by Emily X. R. Pan, which I reviewed back in April. But there is one particular element of this beautiful, heartbreaking story I want to focus more on today; Leigh's experience of living with her depressed mother. As you may know by now, I have anxiety. What you won't know is that both my parents have depression. My Mum has had depression since I was around 11, and my Dad was diagnosed after I became an adult, so I understood depression more when he was diagnosed, and found it easier to deal with. But it's not something I fully understood as a pre-teen and a young teenager, and watching my Mum struggle was so, so hard. In The Astonishing Colour of After, through flashbacks we get to see Leigh's memories of how depression affected her mum, Dory. Her decline, her recovery, and then her relapse that led to her death by suicide (at least this is what she remembers. We find out later in the book that Dory has had depression a lot longer than Leigh realised). I found myself relating to Leigh so much in these scenes. Mum's depression was never as severe as Dory's - where Dory struggled to even get out of bed most days, my Mum always made it up - I still found it difficult to deal with the fact that there was nothing I could do, or anyone could do, to make her happy again. I remember one morning, around 11, I was getting ready for school, and just about to leave when I found my Mum crying, being comforted by my Dad. So I wasn't late, Dad said he would take me to school in the car, so I could stay a few minutes more to be reassured Mum was ok. But once I got to school, I was still really upset, and cried to my friends. Unbeknown to me, my Dad hadn't left yet, he had stayed in the car, watching to see if I was ok. As I wasn't he came over, spoke to a member of staff, explained the situation, said I would be late, and took me back home, again, to see that my Mum was ok, who had stopped crying by then. I was upset because Mum was upset, and feeling hopeless that I couldn't help her, as there was no real reason for her to be upset. It was the depression. So I really related to Leigh, when she would come home and Dory would be in bed, or lying on the sofa. But it was harder for her, because her dad travelled a lot for work, and was barely home. So she had this responsibility she put on herself to look after her mum, but at the same time she couldn't. On top of that, there were things she wasn't being told - treatment her mum was having, or just how bad things had got, the reason her mum had to go to hospital that one time. And then there's the resentment she would feel when her dad bought her mum a cat, in the hopes of bringing her some joy, and now her mum would get up to feed the cat, get it fresh water, sort out it's litter tray, but she wouldn't get up for Leigh. But that was only until she wasn't getting up even for the cat any more. Leigh goes through so many emotions; sadness, sorrow, fear, resentment, guilt, anger. And I didn't blame her for any of them. I guess I was lucky that Dad didn't go away on business trips like Leigh's dad, that he was around to help my Mum, and that I was to a certain degree sheltered from the worst of it. Leigh has it so hard. And she never fully gets it, she doesn't know why her mum is depressed. All she knows is that Dory doesn't see her own parents, doesn't talk about them, doesn't talk about Taiwan. We learn, as the story goes on, through other people's memories Leigh accesses as part of the magical realism aspect of the story, that there has been tragedy in her mother's life. Although that's not the reason she has depression - there is no reason for depression - her own sadness over her past contributes to her depression. When unresolved issues lead to anger, guilt, and sorrow that she can never get past, it's not completely surprising she struggled so much with her depression. I'm not a doctor, so I could be wrong, but I think it's possible her depression may not have been so bad if she had resolved her family issues. But families are complicated, and things are not always that easy. And who's to say it would have made any difference? What may have made a difference, for Leigh at least? Talking. If she felt she could talk to her father, if she felt she wasn't being kept in the dark, if she didn't feel like her mother's illness was something to be hidden, if she didn't feel like she had to pretend everything was fine with her friends, perhaps things would have been that little bit easier before her mother died. And maybe then she wouldn't have felt so guilty after her mother did. Living with a parent who has depression is hard. It's heartbreaking to see them suffer. But having a family who is open about talking about depression, about talking about it as an illness - a mental illness - as something that is nothing to be ashamed of, as something that is treatable, as something that, while it may not go away completely, can get better, does make it easier. I related to Leigh in a number of ways, but I wasn't shut out, nor left to carry the responsibility of looking after a depressed parent. We need to talk about depression. We need to talk about mental illness. And we need to talk about suicide. 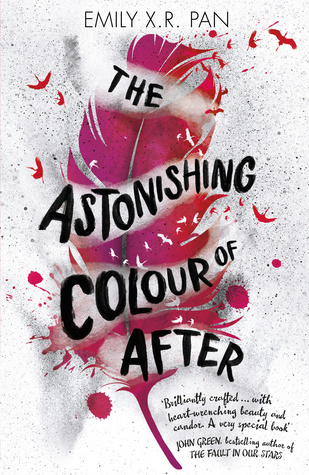 Please do read The Astonishing Colour of After by Emily X. R. Pan. It's absolutely incredible, and I can't recommend it enough. Now, it's over to you. If you've been in Leigh's and my shoes, what did you think of this element of the story? Are there any books where you found you related to a particular element of a story strongly? What did you think of The Astonishing Colour of After in general? Let me know! This sounds like a powerful read. Thank-you for sharing your connection to the story. I do have this one on my TBR because I was curious about the magical realism aspects. It is really powerful, and so gorgeous! Oooh, I hope you enjoy it, it's so, so beautful!